Whether you’re doing intense cardio, yoga or weight training, all forms of exercise require energy. 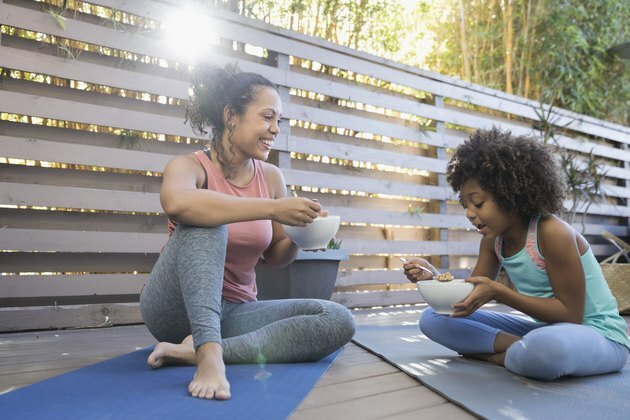 Even if you find your workout is “fine” without fueling up in advance, having the right type of energy readily available to your body can enhance your workout. But what should you eat or drink before your workout? And when should you do it? Here’s what you need to know to properly fuel your sweat sessions. Though pre-workout needs vary, there are basic principles to follow. Mainly, think carbs! And aim to have a meal about three hours (or a maximum of four hours) before your workout. Base it on complex carbohydrates to fuel your working muscles and maintain blood sugar, plus a little lean protein for repairing muscles. It should be relatively low in fat and fiber to assure easy digestibility and minimize stomach distress. More specifically, for a 150-pound person, consuming 75 to 135 grams of carbohydrates and 10 to 15 grams of protein about three to four hours before a workout is in line with recommendations of the International Society of Sports Nutrition. For pre-workout meals, consider banana pancakes with a small yogurt and glass of 100 percent fruit juice; a grilled chicken sandwich (with two ounces of chicken) with fruit salad and unsweetened ice coffee; or a snow pea, carrot and organic tofu stir-fry over plenty of steamed rice with unsweetened green tea. And don’t forget that being properly hydrated is key! Snacking is part of a pre-workout fueling strategy too. Eating a carb-rich snack close to exercise time is beneficial for performance, especially when there’s not enough time for a meal beforehand. “It should feel light on the stomach and shouldn’t weigh you down,” says DJ Blatner, RDN, nutritionist for the Chicago Cubs. Whether it’s a meal or a snack, certain foods offer particularly appetizing attributes. 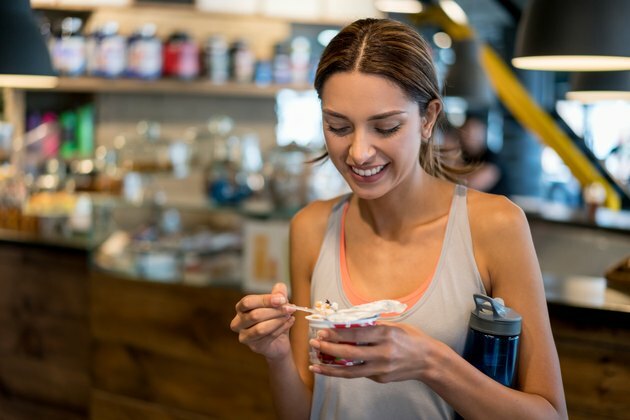 Read on to find the top performance-enhancing munchies recommended by nutrition and fitness pros — and how to include them in your pre-workout routine. “Beets contain nitrates, which help increase energizing oxygen to muscles; banana has carbs for energy; nut butter has protein for muscle repair; water is hydrating; and sea salt contains the electrolyte sodium, which is lost in sweat,” says Blatner. “Yogurt and honey have carbs for energy. 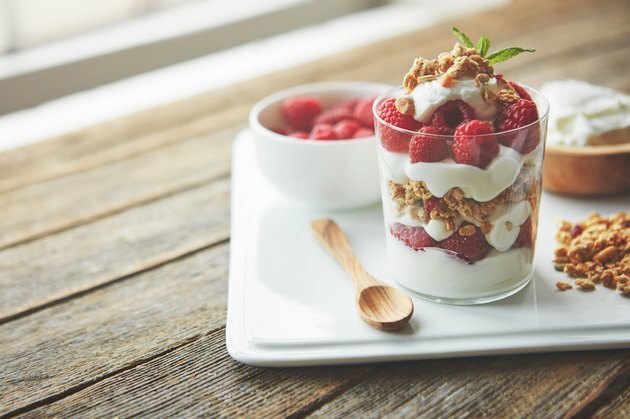 Yogurt also has protein for muscle repair and probiotics to keep the digest tract feeling good through a workout. And matcha contains caffeine to help energize a workout,” says Blatner. “Most people don’t think of lentils as a pre-exercise food, but in my experience, they provide real staying power,” says Cynthia Sass, RD, New York City and Los Angeles-based performance nutritionist. And research backs this up. In a study published in International Journal of Sports Medicine, scientists served athletes either lentils (another non-pulse high glycemic index starch) or a placebo and had them do various treadmill workouts. The results: The lentil eaters were able to go 23 percent longer! And there’s more! “Lentils offer B vitamins, which help convert their carbohydrates into usable energy, and antioxidants, which may help protect against exercise-induced cell damage,” says Sass. Slurp up a cup of lentil soup 60 to 90 minutes before activity to allow time for digestion due to lentils’ fiber and protein content. And note that potential gas or bloating can be lessened when lentils are consumed regularly. A good rule of thumb before a workout: When in doubt, grab a banana 20 to 30 minutes before exercise. They’re easy to digest and generally won’t trigger bloating or digestive upset. “That’s key because keeping the gut happy is one of the primary objectives of a pre-workout food, so you won’t inhibit performance,” says Sass. And there’s much more to this fun, carb-packed fruit. “Bananas have a relatively low glycemic index, which means they provide slow-burning fuel; they’re packed with potassium, which supports heart function and muscle contractions, prevents muscle cramps and helps maintain muscle mass; and they contain vitamin B-6, which supports mental clarity and helps regulate blood sugar levels for sustained, level energy,” says Sass. 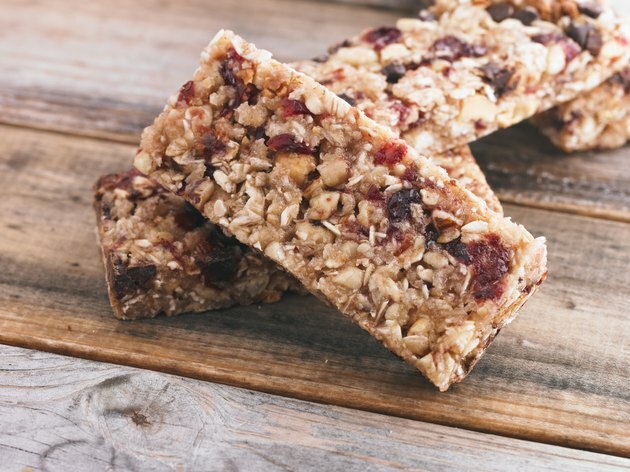 For a quick snack before yoga class, grab a bar 30 minutes to two hours beforehand. Keri Gans, RDN, a nutritionist, author of “The Small Change Diet” and spokesperson for KIND Snacks recommends a KIND Nuts & Spices Dark Chocolate & Sea Salt Bar. While eating too much fiber before exercising may cause discomfort for high-performance individuals and athletes, it may be beneficial for those practicing lighter-intensity activity. So all you yogis, take note! A dairy-fruit combo is helpful for weightlifting too. Go for Greek yogurt and a banana before lifting, says Heidi Skolnik, founder of Nutrition Conditioning, LLC, and a nutritionist at the Women’s Sport’s Medicine Center at Hospital for Special Surgery. 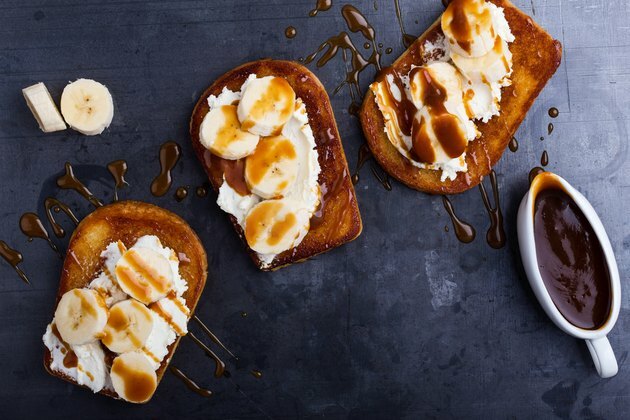 Toast isn’t just for breakfast. Glamming it up a bit can be ideal for a pre-workout snack about an hour before endurance workouts like running, swimming or cycling. Natalie Rizzo, RD, a New York City-based sports dietitian who works with pure maple syrup from Canada, enjoys a piece of whole-wheat toast with cinnamon and a drizzle of pure maple syrup. And the pure maple syrup provides quick-acting fuel from carbs, plus numerous polyphenols. “Research indicates the polphyenols may improve athletic performance in healthy adults,” says Rizzo. Got 30 to 60 minutes before your workout? Rizzo suggests gathering three pitted Medjool dates and stuffing each with two whole almonds and adding a dusting of sea salt. Medjool dates provide a good dose of simple carbohydrates and potassium (50 percent more than bananas), says Rizzo. Because potassium is an electrolyte lost when sweating, potassium-rich foods can play a role in proper hydration while potentially preventing post-workout cramping. The almonds provide some protein and crunch, which will help keep you full throughout the workout, and the salt brings out the natural sweetness of the dates while helping to replace salt you may lose in sweat, Rizzo says. If your workout is less than 30 minutes away, you’ll want to grab something quick, carb-centric and easy to digest, says Skolnik. One of her favorite picks is 16 to 25 mini pretzels. A jolt of caffeine can boost your workout performance! So, have a pre-workout latte with milk 60 minutes before your workout, says Skolnik. “It also helps with what’s called ‘rating of perceived exertion (RPE),’” says Skolnik. 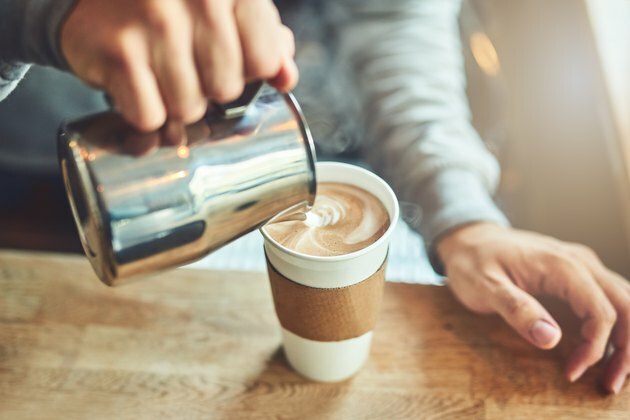 Basically, caffeine can help you do more because you feel better working harder. Since that caffeine is coupled with the milk in a latte, it’s especially beneficial as a pre-workout snack for either aerobic or anaerobic (power/resistance) workouts, says Skolnik. The milk contains carbohydrate and protein, including leucine, an amino acid that directly stimulates muscle protein synthesis. “You may need to experiment with timing and ‘dosage’ — and do not consume caffeine if you’re prone to runner’s trots (diarrhea); caffeine may or may not help based on whether you’re a responder or not,” says Skolnik. Move over, sports drinks! Drink a glass of tart cherry juice 90 minutes prior to exercise. It keeps you hydrated, maximizing exercise intensity and endurance and helping you get the most out of your workout, says Lyssie Lakatos, RDN, CDN, and Tammy Lakatos Shames, RDN, CDN, aka, The Nutrition Twins. “It also contains potent phytonutrients that help to protect muscles against damage.” According to a study published in the Scandinavian Journal of Medicine & Science in Sports, Montmorency tart cherry juice improved various aspects of exercise performance, including improving exercise intensity, they add. It may help lessen inflammation too. Iced green tea is a beverage with benefits! Of course, it helps hydrate, but it also contains caffeine, which has been shown to help improve performance, increase strength and power, reduce feelings of fatigue and potentially stimulate fat burning, say Lakatos and Shames. Sip on the iced green tea for several hours leading up to exercise, though the peak effects of the caffeine are experienced 90 minutes after consuming. But, it can be effective as quickly as 15 to 60 minutes after having it.